Construction is one of the most challenging industrial environments for effective people management. It is characterised by geographically dispersed projects, production-oriented management styles, long working hours, high levels of staff turnover and employment practices grounded in the traditional ‘personnel’ paradigm. The employee resourcing function – recruitment, selection and deployment – is largely reactive and intuitive, and fails to draw on the longer-term benefits of strategic human resource management (SHRM). This book explores the challenges inherent in employee resourcing in-depth. 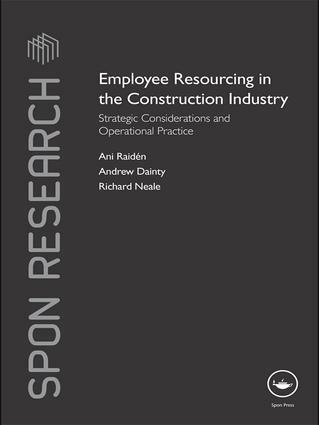 It provides insights into the strategic considerations and operational approaches adopted by large construction organisations in deploying their human resources. It presents an improved framework for informed SHRM-style decision-making derived from an extensive study conducted within eight major construction organisations. This book provides a valuable resource for both students and practitioners interested in evaluating and improving current organisational practice. Ani B. Raiden is Senior Lecturer in Human Resource Management at Nottingham Business School. Andrew R. J. Dainty is Professor of Construction Sociology at the University of Loughborough. Richard H. Neale is Head of the Faculty of the Built Environment at the University of Glamorgan.